In this quickstart tutorial, you use the Azure portal to create a Linux virtual machine with SQL Server 2017 installed. In the left pane, select Create a resource. In the Create a resource pane, select Compute. Select See all next to the Featured heading. In the search box, type SQL Server 2017, and select Enter to start the search. Limit the search results by selecting Operating system > Redhat. Then, under Publisher, choose Microsoft. Select a SQL Server 2017 Linux image from the search results. This tutorial uses Free SQL Server License: SQL Server 2017 Developer on Red Hat Enterprise Linux 7.4. The Developer edition lets you test or develop with the features of the Enterprise edition but no SQL Server licensing costs. You only pay for the cost of running the Linux VM. Under Select a deployment model, choose a deployment model that fits your workload needs. For new workloads, use Resource Manager. To connect to an existing virtual network, select the virtual network's deployment method for your workload. For more information about deployment models, see Azure Resource Manager and classic deployment models. In the Basics tab, select your Subscription and Resource Group. In Virtual machine name, enter a name for your new Linux VM. Region: Select the Azure region that's right for you. Availability options: Choose the availability and redundancy option that's best for your apps and data. Change size: Select this option to pick a machine size and when done, choose Select. For more information about VM machine sizes, see Linux VM sizes. For development and functional testing, use a VM size of DS2 or higher. For performance testing, use DS13 or higher. Authentication type: Select SSH public key. You have the choice of using an SSH public key or a Password for authentication. SSH is more secure. For instructions on how to generate an SSH key, see Create SSH keys on Linux and Mac for Linux VMs in Azure. Username: Enter the Administrator name for the VM. SSH public key: Enter your RSA public key. Public inbound ports: Choose Allow selected ports and pick the SSH (22) port in the Select public inbound ports list. In this quickstart, this step is necessary to connect and complete the SQL Server configuration. If you want to remotely connect to SQL Server, also select MS SQL (1433) to open port 1433 for connections over the Internet. Make any changes you want to the settings in the following additional tabs or keep the default settings. In the Review + create pane, select Create. If you're running on Windows and don't have a BASH shell, install an SSH client, such as PuTTY. On the PuTTY configuration screen, enter your VM's public IP address. Select Open and enter your username and password at the prompts. 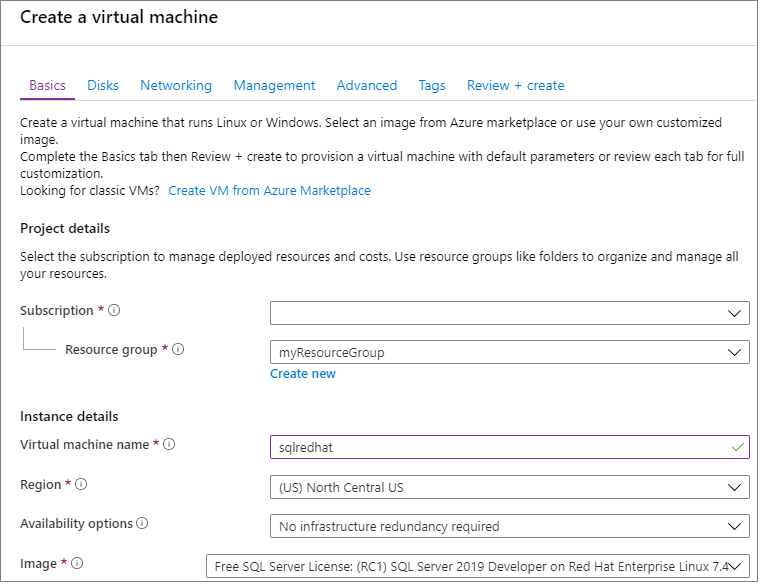 For more information about connecting to Linux VMs, see Create a Linux VM on Azure using the Portal. If you see a PuTTY security alert about the server's host key not being cached in the registry, choose from the following options. If you trust this host, select Yes to add the key to PuTTy's cache and continue connecting. If you want to carry on connecting just once, without adding the key to the cache, select No. If you don't trust this host, select Cancel to abandon the connection. The new virtual machine installs SQL Server with a random SA password. Reset this password before you connect to SQL Server with the SA login. Enter a new SA password and password confirmation when prompted. Several SQL Server packages are installed by default, including the SQL Server command-line Tools package. The tools package contains the sqlcmd and bcp tools. For convenience, you can optionally add the tools path, /opt/mssql-tools/bin/, to your PATH environment variable. 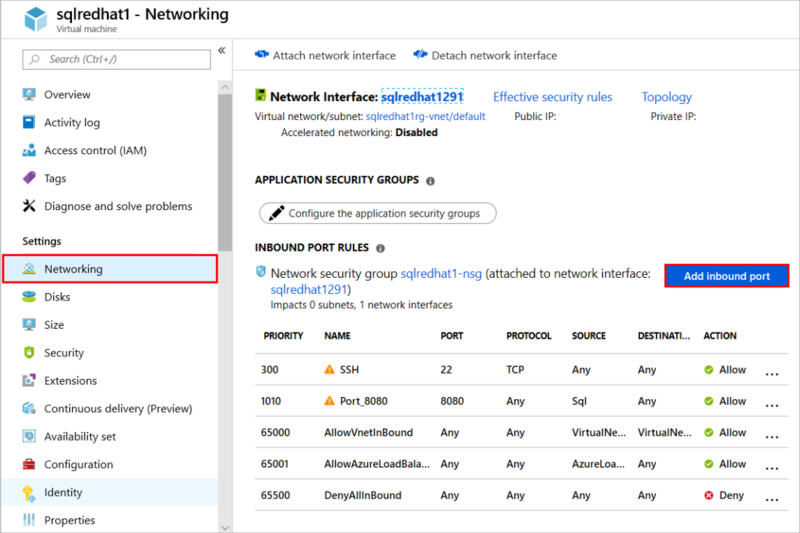 If you need to remotely connect to SQL Server on the Azure VM, you must configure an inbound rule on the network security group. The rule allows traffic on the port on which SQL Server listens (default of 1433). The following steps show how to use the Azure portal for this step. 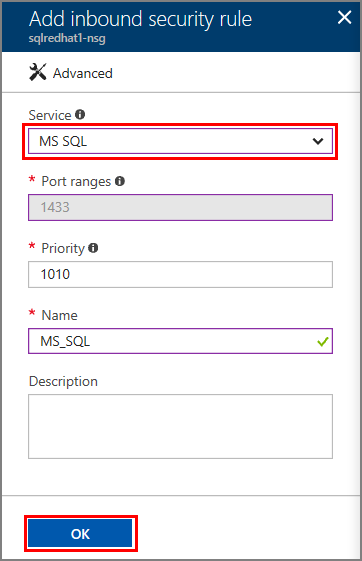 If you selected the inbound port MS SQL (1433) in the settings during provisioning, these changes have been made for you. You can go to the next section on how to configure the firewall. In the left navigation pane, under Settings, select Networking. In the Networking window, select Add inbound port under Inbound Port Rules. This tutorial directed you to create a Red Hat Enterprise Linux (RHEL) VM. If you want to connect remotely to RHEL VMs, you also have to open up port 1433 on the Linux firewall. Connect to your RHEL VM. Now that you have a SQL Server 2017 virtual machine in Azure, you can connect locally with sqlcmd to run Transact-SQL queries. For more general information about SQL Server on Linux, see Overview of SQL Server 2017 on Linux. For more information about using SQL Server 2017 Linux virtual machines, see Overview of SQL Server 2017 virtual machines on Azure.